Rock N Roll Easter - Mar. 28th, 2-4pm hosted by the Pentecostals of Bastrop at 261 FM 20 in Bastrop. Glow in the Dark Easter Egg Hunt, food, bounce houses, games, and more! Elgin Public Library - Mar. 31st, 11am & 4:30pm at 404 N. Main Street in Elgin. Golden Age Home - April 3rd, 10:00-11:30am at 1505 S. Main Street in Lockhart. Carnival games, moon bounce, and hot dogs! Silver Pines Nursing Center - April 3rd, 11am-1pm at 503 Old Austin Highway in Bastrop. Easter Egg Hunt, games, refreshments, and more! 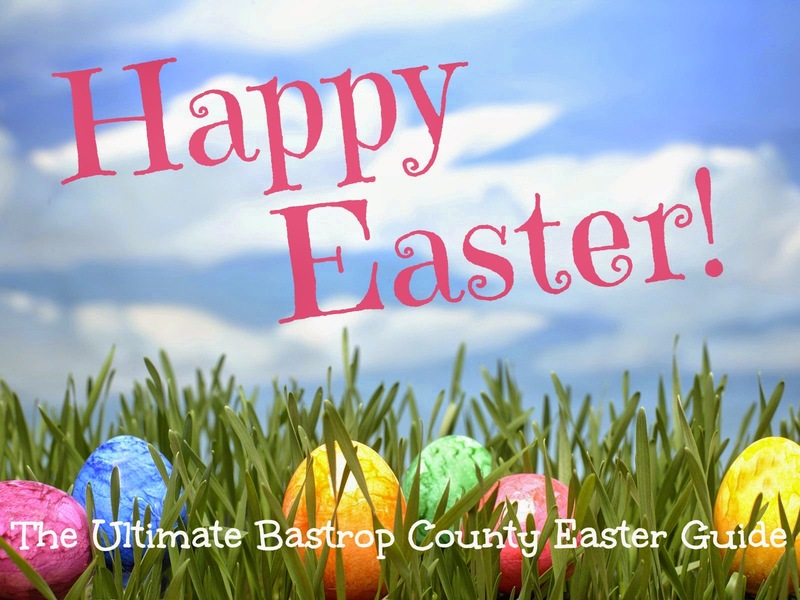 Bastrop YMCA - April 4th, 8-11am at Bob Bryant Park in Bastrop. Crafts & activities from 9-10am. Easter Egg Hunt: preschool and under 10am, K-2nd grade 10:20am, 3rd-5th grade 10:40am. Blue Bunny Easter Egg Hunt - April 4th, 9:45am hosted by the Smithville Police Association at the gazebo in Railroad Park located at First and Main Streets in downtown Smithville. Redeem Fitness - April 4th, 10am at 962 Hwy 71 E in Bastrop. FREE WOD (workout of the day) at 9am, Easter Egg Hunt for the kids afterward. Cedar Creek United Methodist Church - April 4th, 10am-12pm at 5630 FM 535 in Cedar Creek. Home Depot - April 4th, 10am-1pm at 525 Hwy 71 W in Bastrop. Easter Egg Hunt at 12pm. Popcorn, snow cones, candy, fire trucks, petting zoo, vendor demonstrations, and more! Elgin Community Easter Egg Hunt - April 4th, 10am-1pm at Thomas Memorial Park, located at 411 Madison Street in Elgin. Ages 2-5 10:15am, ages 14-16 10:30am, ages 6-9 10:45 am, ages 10-13 11:00am, ages 17-24 11:15am, ages 25+ 11:30am. First United Methodist Church - April 4th, 10am-12pm at 1201 Main Street. Easter Egg Hunt, face painting, crafts, the Easter Story, and more! Walgreens - April 4th, 10am-2pm at 4201 Hwy 71 E in Bastrop (Tahitian Village location). Easter Egg Hunt around 10:30am, raffle, cake walk, games, health info, and more! Easter Egg Hunt & Bake Sale - April 4th, 10am hosted by the McDade Historical Society at the Museum, located at the intersection of Main Street and Loop 223 of Highway 290 in McDade. Jersey Barnyard - April 4th at 3117 State Hwy 159 in La Grange. Four Easter Egg Hunts: ages 0-2 at 10:30am, ages 3-4 at 10:45am, ages 5-7 at 11am, and ages 8-12 at 11:15am. Neighbor's Kitchen and Yard - April 5th, 2pm at 301 Chestnut Street in Bastrop. Games and live music from 12-5pm. La Hacienda - April 5th, 2-3pm at 1800 Walnut Street in Bastrop. Easter Egg Hunts for ages 0-5 and 6-11 with prizes, candy, and grand prize of lunch/dinner for up to 5 people! Mission U-Too North - April 5th, 4:30pm at 603 Linden Street in Bastrop. Easter Egg Hunt for the kids and FREE burgers and hot dogs for everyone! Bible Study following at 6pm. Sugar Shack - Mar. 28th & April 4th, 12-3pm at 114 Loop 150 W in Bastrop. Bring your own camera. Jersey Barnyard - April 4th, 9am-6pm at 3117 State Hwy 159 in La Grange. Bring your own camera. Home Depot - April 4th, 10am-1pm at 525 Hwy 71 W in Bastrop. Bring your own camera. Walgreens - April 4th, 10am-2pm at 4201 Hwy 71 E in Bastrop (Tahitian Village location). Living Room Bookstore - 301 Hwy 71 W in Bastrop. Bibles, Resurrection eggs, Easter books, stuffed animals, toys, candy, and more! Sugar Shack - 114 Loop 150 W in Bastrop. Easter baskets, candy, stuffed animals, toys, and more! Liberty Glenn - 1011 Main Street in downtown Bastrop. Easter baskets, décor, dinnerware, and more! Second Chance Childrens Resale - 804 Water Street in downtown Bastrop. Children's Easter outfits, Easter bonnets, toys, and more! Bastrop YMCA - April 3rd, 2-3pm at the Kerr Community Center, located at 1308 Walnut Street in Bastrop. Ages 5-10. $8/child for YMCA members, $15/child for non-members. Bastrop Christian Ministerial Alliance - April 5th, 7-9am at Bastrop State Park behind the Refectory. Pastor John Eason of Celebration Community Church will conduct the message. Music by Terry Lyne Moore and Dale Burke. Bring a lawn chair. Park entrance fees will be waived for those attending the service. If it's raining, the service will be held at Calvary Baptist Church, located on Loop 150 across from the entrance to the State Park. If you have an event to add to the list, please email the event details (including name of the event, date, time, location, and any other important information) to info@365bastrop.com.